Established as a Belgian colony in 1908, the Republic of the Congo gained its independence in 1960, but its early years were marred by political and social instability. Col. Joseph MOBUTU seized power and declared himself president in a November 1965 coup. He subsequently changed his name - to MOBUTU Sese Seko - as well as that of the country - to Zaire. MOBUTU retained his position for 32 years through several subsequent sham elections, as well as through the use of brutal force. Ethnic strife and civil war, touched off by a massive inflow of refugees in 1994 from fighting in Rwanda and Burundi, led in May 1997 to the toppling of the MOBUTU regime by a rebellion led by Laurent KABILA. He renamed the country the Democratic Republic of the Congo (DRC), but in August 1998 his regime was itself challenged by an insurrection backed by Rwanda and Uganda. Troops from Angola, Chad, Namibia, Sudan, and Zimbabwe intervened to support the Kinshasa regime. A cease-fire was signed in July 1999 by the DRC, Congolese armed rebel groups, Angola, Namibia, Rwanda, Uganda, and Zimbabwe but sporadic fighting continued. Laurent KABILA was assassinated in January 2001 and his son, Joseph KABILA, was named head of state. In October 2002, the new president was successful in negotiating the withdrawal of Rwandan forces occupying eastern Congo; two months later, the Pretoria Accord was signed by all remaining warring parties to end the fighting and establish a government of national unity. A transitional government was set up in July 2003; Joseph KABILA remains as president and is joined by four vice presidents representing the former government, former rebel groups, and the political opposition. The transitional government held a successful constitutional referendum in December 2005, and plans to hold a series of elections in 2006 to determine the presidency and National Assembly seats. 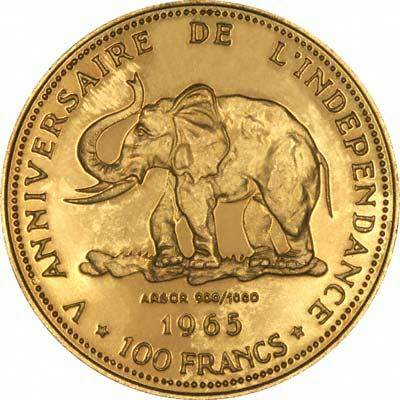 It seems odd that Congo did not issue any commemorative gold coins in 1960 when it became independent, however it redressed this omission five years later, when in 1965, it issued gold proof coins for the 5th anniversary of independence. * Krause states that approximately 70% of the entire mintage was melted. If this is correct, it means that under 1,000 coins remain extant. 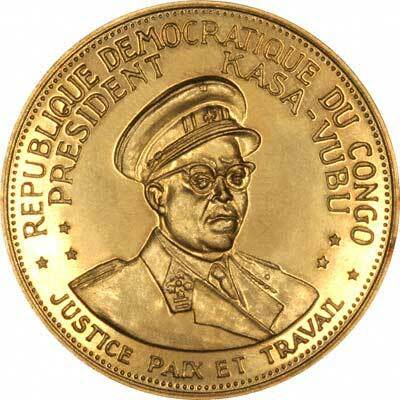 For silver and base metal coins of Congo, please look at our original Chard Coins website.